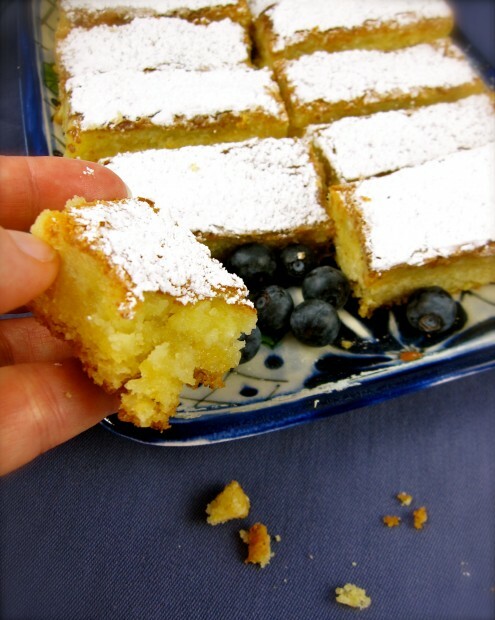 Call me a snob but I never thought I’d post a recipe for a dessert that used a boxed cake mix. At least never until I tasted my sister-in-law’s “Melt Away Bars”. There are many “Melt Away Bar” recipes I’ve made through the years, but Susanne’s version is different and takes the cake. I’ve been invited to an Easter Egg Hunt on Saturday and these bars would be the perfect treat to bring. “You could use lemon cake mix and it’s lemony. You could use German chocolate mix and it’s chocolaty. You don’t need to tell people it came out of a box,” said Susanne, as I nibbled on my second bar. 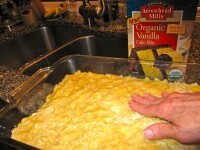 I had to have this easy recipe but I was alarmed at the list of ingredients on the box of the yellow cake mix she used. I don’t put too many restrictions on my diet except for one cardinal rule: Avoid highly processed food. I realize most every food product purchased in a traditional retail food environment is processed on some level, so “highly” is the operative word. I wondered if I’d have the same results using an organic cake mix that uses half of those unpronounceable ingredients? I decided on Arrowhead Mills Organic Vanilla mix. I’ve also seen other organic cake mixes at many other groceries in town. These turned out to be so easy and simply delicious – I personally preferred the more toothsome texture and flavor of these organic mix bars. Better yet, they freeze well and will still be as yummy, refrigerated, for Saturday’s Easter Egg hunt. I (smugly) told Susanne about my switch. Her response? “Come on, Peggy. What do you plan to do about the sugar and butter?” Spoiler. In another mixing bowl, with an electric beater, combine confectioners sugar, cream cheese, remaining 2 eggs and lemon zest; beat until creamy. 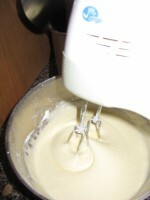 Pour mixture evenly over cake. Bake on middle rack of oven 30-40 minutes or until lightly browned and a toothpick inserted into the middle comes out clean. Cool. Sprinkle with confectioner’s sugar. Refrigerate until ready to cut into 2 1/2-inch by 1-inch bars. I was just browsing around and happened on this recipe. They sound yummy as they are in your recipe, but I can’t figure out what happened to the lemon. Did the title get stuck into the wrong recipe during the move? Otherwise how are these bars “lemony”? Nick! Welcome to my site, and heartfelt gratitude to the catch. (The transfer process, decided it didn’t want lemon in the bars.) The juice and zest have returned to their correct positioning.